Not long ago, I started playing Minecraft again and got really into it. Every chance I get, I’m designing new things on paper, which I want to build on Minecraft like mazes and places where you kill different animals and monsters (mobs) to get experience points which you can use to upgrade armour, tools and weapons. You can also make machines using redstone dust (electricity based substance) and repeaters and comparators which can act like circuits in a computer chip. Minecraft also boosts imagination and lots of other useful skills. This makes Minecraft a fun tool to help you learn important skills. These pictures are things that I’ve built on Minecraft and are useful mechanisms to help life on Minecraft easier. The 1st picture above is for a stone generator and the second a machine to block lava. This entry was posted in Games, Toys and tagged Block by Block, games, minecraft on April 9, 2019 by Dillon. At the weekend, I got this dinosaur set called Dinosaur DNA. I had to excavate a plaster block, which contained dinosaur bones and DNA stickers. Once excavated, I had to put the bones together to create a T-Rex. The skeleton glows in the dark. Then I had two A R play mats and I had to stick the DNA stickers over the question marks. After that, I had to download the app called Dino Codes and scan the play mats, one features the set’s dinosaur and the other is a mysterious scene, mine were a volcano and a T-Rex. It was amazing and I would love to get the other two sets. This entry was posted in Reviews, Toys on November 29, 2016 by Dillon. On Monday we went to Rivington Pike up to the top and I only had one rest on the whole journey which was at the top of the Pike, so I was exhausted by the time I got to the top! The view was the best I’d ever seen it I could see so far out! This is the view from the pike. On Tuesday Grandad came to babysit and bought us each a Galaxy Chocolate Flurry that was delicious. After tea we played a game of Bugs In The Kitchen and two games of Monopoly Deal. On Wednesday we watched ” Honey, I Shrunk The Kid”, which was really good I’m really looking forward to watching the next one “Honey, I Blew Up The Kids “. On Friday we went to WHSmith in Manchester to spend our £20 Gift Cards from Uncle Bob Auntie Lauren and Brandon. First we went to Debenhams for Georgia to spend her £25 voucher and I looked at a lot of things that I really liked there were so many of them! Then we went to WHSmith and I bought three books for the price of two which were The Person Controller, Tom Gates Everything’s Amazing (sort of), Tom Gates Genius Ideas (mostly) and a Brainbox The World. Afterwards we went to BrewDog and I started reading Tom Gates Everything’s Amazing (sort of) and had a apple fritz which was delicious. After that we went out for tea at Yard and Coop and we had buttermilk fried chicken, sweet potato chips and normal chips and sauce for mains, I had a Mama Mia sauce which is just an Italian pasta sauce which was really nice. Our sides were Not chicken which is Halloumi in breadcrumbs, slaw and amazeballs which are corn balls. For dessert we had two brownies which were amazing. I really enjoyed the whole of my half term and would love to do everything again! The buttermilk fried chicken was delicious and so were all the sides, Friday was probably the best day of the whole week and Yard and Coop was probably the best thing!!! This entry was posted in Books, Days Out, Food Reviews, Holiday, Restaurants, Reviews, Sleepovers, Toys and tagged Brewdog, Pike, Restaurants, Rivington on February 28, 2016 by Dillon. 10 Comments so far. Add another? First of all I went to the beach in lytham st. Annes near Blackpool. We went on the beach and played frisbee and I buried the frisbee two times, covered it up in the sand and dug down to find it. Afterwards we had fish and chips for tea. Then we went to my Grandma’s house for a sleepover. In the morning we had weetabix (fruit and nut) minis for breakfast and played my new MINION Top Trumps. Then for dinner we had one bacon sandwich and one sausage sandwich, but at 2:50 we had to go to my other Grandad’s house. My parents were going to be back for half seven, but there had been a aciddent on the train track, so the trains stopped working and then we had to have a sleepover at my Grandad’s house. The next day me and my sister played mario karts on the wii until we had to go home. When we got home I had a pressent from Brandon, Uncle Bob and Auntie Laruen. It was a bright, yellow remote control porsche car. This entry was posted in Days Out, Family, Sleepovers, Toys and tagged sleepover on August 9, 2015 by Dillon. 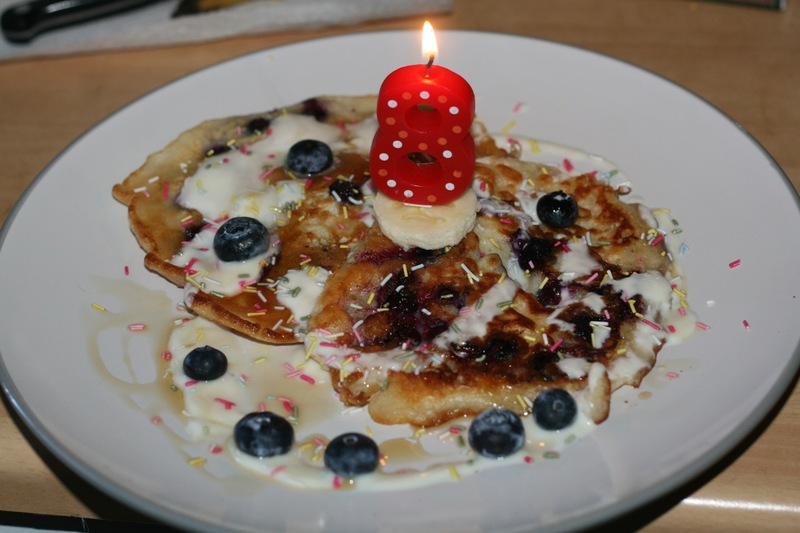 First I opened my cards and had blueberry pancakes with sprinkles and maple syrup which was delicious. It also had a candle on in the shape of an eight. Then I had pasties for dinner and some lemon cake with lemon curd in the middle and foam bananas and yellow smiley face toffees on top. Then one of my Grandads came and give me ten pounds and some shoes. Afterwards we went to a cineama in the great nothern in Manchester to watch MINIONS. Then we went out for tea at an Italian restraunt and had pizza. Then my other Grandad came and give me a new scooter and ramp to drive up on my scooter. This entry was posted in Birthday, Days Out, Family, Restaurants, Toys and tagged birthday, eight(8) on July 26, 2015 by Dillon.